With the fast-paced environment that surrounds us in college, we need to remember to step back and make sure to breathe every once in awhile. Some moments may feel like a nonstop rush with no end in sight. The one thing I learned that helped me become a stronger learner throughout college was the use of an app known as Headspace. Headspace is an app that I use every morning to meditate and clear my head. There are many studies that prove meditating and mindfulness positively impact mental and physical health. It is known to reduce stress and increase focus, two things necessary to become a successful learner. Before I started using Headspace, I had really bad test anxiety and trouble concentrating on my work for long periods of time. But once I started practicing the art of mindfulness, I felt like a different person. The calm persona that allowed me to approach school in a positive manner came about through the use of Headspace. Take it from me, you want to do everything possible to increase your energy and drive in a natural yet effective way. If you just take some time every morning to meditate and clear your mind, you will reap the benefits of mindfulness. 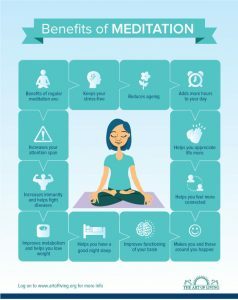 I wish I started meditating a lot sooner. If you don’t want to take my word for it, listen to the extensive research done on meditation that proves that it really does work. Happy meditating!